Specialty CME Credits: Included as part of the 4 credits, this CME activity is eligible for 4 Trauma CME, 1 Pain Management CME, 0.25 Infectious Disease CME, and 0.5 Pharmacology CME credits, subject to your state and institutional approval. Traumatic wounds and lacerations are common pediatric presenting complaints to emergency departments. 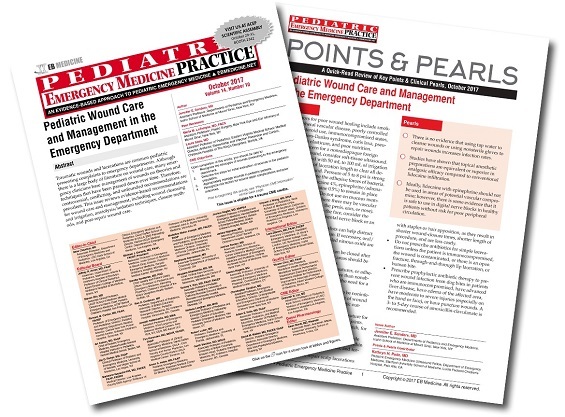 Although there is a large body of literature on wound care, many emergency clinicians base management of wounds on theories and techniques that have been passed down, so controversial, conflicting, and unfounded recommendations are prevalent. 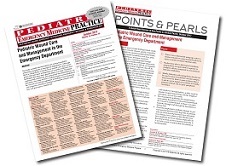 This issue reviews evidence-based recommendations for wound care and management, including wound cleansing and irrigation, anxiolysis/sedation techniques, closure methods, and post-repair wound care. A 2-year-old boy presents with a chin laceration that occurred when he ran into a wall 23 hours ago. The family cleaned the wound with water and applied a bandage. The boy is very upset and screams and runs away when you try to remove the bandage. The resident you are working with asks if the wound should be closed primarily or if it should be allowed to heal via secondary intention. He also asks you what the best way is to handle toddlers who require local wound care.